This topic is about creating app packages for Windows 8.1 Store apps. If you need to create an app package for Universal Windows apps for Windows 10 devices, you need to follow this process instead. These steps apply to Visual Studio 2013. If you are using Visual Studio 2012 to package a Windows 8 version of your app, the steps will differ slightly. 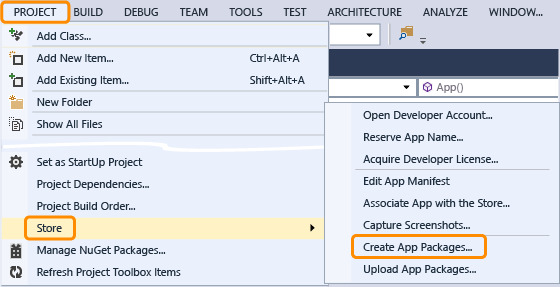 This section helps you start the Create App Packages wizard. If you have trouble starting the wizard, see Help me start the Create App Packages wizard. Create or open a Windows app or Windows Phone app project in Visual Studio Visual Studio 2015. See Templates to speed up your app development. In Solution Explorer, select a Windows app or Windows Phone app project. On the menu bar, choose Project, Store, Create App Packages. The Create App Packages wizard appears. If this option is disabled or does not appear at all, see Help me start the Create App Packages wizard. On the menu bar, choose Store, Create App Packages. In the Create Your Packages page of the wizard, choose the Yes option button. If you haven’t already established a developer account, choose the create an account link. See Ready to Sign up? In the Sign In dialog box, enter the Microsoft account and password you created the developer account with, and then choose the Sign In button. The Select an app name page of the wizard appears. In the Create Your Packages page of the wizard, choose the No option button, and then choose the Next button. The Select and Configure Packages page of the wizard appears. Have you selected the project in Solution Explorer? The Create App Packages option is enabled only if a project is selected in Solution Explorer. Are you using a Windows app or Windows Phone app project? For example, Windows Phone Silverlight apps can’t be packaged by using this wizard. If you want to package one of those, see Prepare your Windows Phone Silverlight 8.1 app for publishing. Are you using Visual Studio 2012? If you are using Visual Studio 2012 to maintain a Windows 8 version of your app, the Create App Packages option won’t appear until you install the Tools for Maintaining Store apps for Windows 8. See Service the Windows 8 version of your app. This procedure applies only to apps that you want to publish to the Store. If you haven't already reserved a name for your app, enter a name in the Reserve a new app name box, and then choose the Reserve button. See Reserving an app name. Choose the name of the app you want to create this package for, and then choose the Next button. If you’re packaging an update to an app that you’ve already published, select the Include app names that already have packages check box to display names of published apps in the list. In the Output location box, enter the location where the package files will be created. When you’re ready to publish your app, you’ll upload the packages from this location. Allow the version numbers to increment automatically by keeping the Automatically increment check box selected (recommended), or specify a particular version number in the Version box. If you plan to update both the Windows 8.1 and Windows 8 versions of an app and you want to increment the version numbers manually, see Safely applying version numbers to an app package. If the Automatically increment check box is selected, the last field of the version number increases by one each time you package the app. You should increase the major version number manually only if you’ve significantly changed your app. 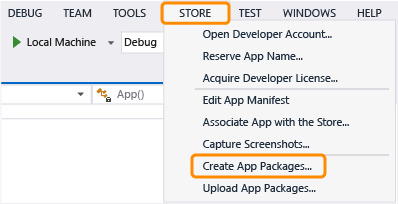 If you're creating a package for the Windows 8.1 version of a Windows Store app, or you're creating a package for a Windows Phone app, in the Generate app bundle list, choose whether you’d like Visual Studio to generate an app bundle for your package. See Deciding whether to generate an app bundle. Under Select the packages to create and the solution configuration mappings, select the check box for each build configuration you want to create a package for. The build configurations grid lists the possible platform architectures of the package (for example, Neutral, ARM, x64, and x86). In each row, a box displays the combination of the current Solution Configuration and Architecture choices that relate to that row’s architecture. The check box for the default platform is set to the current, active project platform. The box for the Neutral row shows the Solution Configuration combinations that contain AnyCPU as the project’s platform. If no Solution Configuration combination is relevant, you can't choose anything in the entire row for that platform. For each build configuration that you specified, choose the Solution Configuration that you want to build. A package will be created for each build configuration that you specified. Select or clear the Include public symbol files, if any, to enable crash analysis for the app check box. If the check box is selected (default), Visual Studio generates the public symbol (.pdb) files and adds them to the .appxupload file. The .appxupload file is created as part of the packaging process and contains two other files: .appx and .appxsym. The .appxsym file is the compressed file that contains the public symbols of your app. When you upload your app and the .appxupload file to the Store, it analyzes the file and uses the public symbols to map crashes of your app. The resulting telemetry information about your app is published for you to review on the developer dashboard. See Submitting your app and Analyzing your apps in the Store. When the packaging process is complete, the Package Creation Completed page appears. If you’re creating a package for the Windows 8.1 version of an app, or you’re creating a package for a Windows Phone app, you can generate an app bundle to reduce the size of the app that users download. Your app takes up less room on their devices, and users can download it faster because they download only the assets that they need. See App bundles. Consider generating an app bundle if your app contains language-specific resources, a variety of image scales, or resources that apply to specific versions of DirectX. If you don't generate one, your app will run just fine, but users will have to download a larger app. One app bundle can contain your packages for all architectures. You should create only one bundle per app. Generate an app bundle only if you've defined language-specific assets, a variety of image-scale assets, or resources that apply to specific versions of DirectX. Don’t generate an app bundle. You might choose this option if you plan to individually service each architecture that your app supports. If you create an app bundle, you can submit your app to the Store more easily because, no matter how many architectures your app supports, you must upload only one .appxupload file. If you don't create an app bundle, you must upload an .appxupload file for each supported architecture. The Windows Store requires the Windows 8.1 version of an app to have a higher version number than the Windows 8 version of the same app. However, the Store doesn’t enforce how much higher that number must be. Therefore, if you manually provide a version number for the Windows 8.1 version, leave enough room between the first version number of the Windows 8.1 version and the most recent version number for the Windows 8 version. Otherwise, you’ll run out of numbers to apply to your Windows 8 version and won’t be able to update it anymore. For example, assume that the most recent version of your Windows 8 app is 1.0.0.1. Then, you publish a Windows 8.1 version of the same app with the version number 1.0.0.2. In this case, you’ve met the Store requirement, but you’ll have no remaining version numbers to use if you want to update the Windows 8 version. If you're applying version numbers manually, you should consider how many version numbers you’ll want to reserve for the Windows 8 version of your app. Unless you have a specific reason to apply your own version numbers, you can let Visual Studio number your versions for you. When you package the Windows 8.1 version for the first time, Visual Studio applies a version number that leaves plenty of available minor version numbers for the Windows 8 version. In the Create App Packages wizard, choose the Launch Windows App Certification Kit button. This option is available only if you specified at least one solution configuration that supports validation. See How to test your app with the Windows App Certification Kit. The Windows App Certification Kit performs tests and shows you the results. See Windows App Certification Kit tests. Under Select a target device to run, choose the Local machine option button, and then choose the Launch Windows App Certification Kit button. You can validate a package for the Windows 8 version of an app by using a remote device that's running either Windows 8 or Windows 8.1. However, you must use a device that's running Windows 8.1 to validate a Windows 8.1 package. Also, the architecture of the target device must match a platform architecture that you specified in Step 3: Select and configure your app package. To validate your app package against a remote device, configure it, and then connect to it. You have to configure a device only once, no matter how many apps you validate with it. From your local development computer, copy the PrepWinACK.exe file to each device that you want to use for validation. If you run the program on an ARM device, you’ll have to reboot it, and then follow the instructions on the screen to complete the installation of the ARM Kit policy. If you encounter issues, see Windows Software Development Kit (SDK) for Windows 8.1. Start the remote debug monitor as described on the Running Windows Store apps on a remote machine webpage. On the Package Creation Completed page of the Create App Packages wizard, choose the Remote Machine option button, and then choose the ellipsis button next to the Test Connection button. The Remote Machine option button is available only if you specified at least one solution configuration that supports validation. See How to test your app with the Windows App Certification Kit. Specify a device from inside your subnet, or provide the Domain Name Server (DNS) name or IP address of a device that's outside of your subnet. In the Authentication Mode list, choose None if your device doesn't require you to log onto it by using your Windows credentials. Choose the Select button, and then choose the Launch Windows App Certification Kit button. If the remote tools are running on that device, Visual Studio connects to it and then performs the validation tests. See Windows App Certification Kit tests.